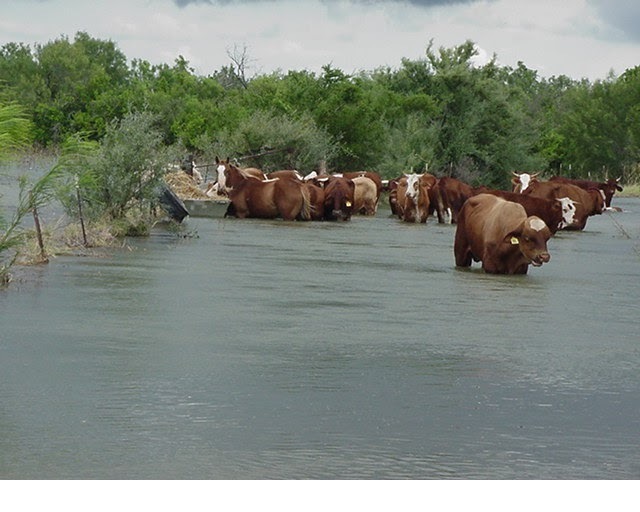 GARCENO, TEXAS - Texas and Southwestern Cattle Raisers Association (TSCRA) Special Ranger Roland Garcia led a volunteer effort Thursday to rescue 29 head of cattle and one Quarter horse mare from two feet of flood waters close to the Rio Grande River. 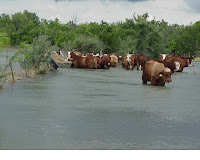 The livestock had been stranded in the flood waters for 10 days. "The continued flooding of the Rio Grande Valley has wreaked havoc on livestock throughout the area," Garcia said. "We were lucky that the rescue effort was successful in saving some of these animals. Unfortunately, we weren't able to save them all. The cattle were tired and desperate, and many of them had swollen legs and were unable to fight the currents. Some turned back seeking safety with the rest of the stranded herd." Garcia was notified of the stranded livestock by a local Rio Grande City veterinarian. Attempts were made to come up with a solution; however, there was no equipment in the disaster area capable of conducting a successful livestock rescue mission. Garcia made one final attempt to rescue the stranded animals. He recruited experienced volunteers including Teo Martinez, TSCRA member and Hidalgo County east side cowboy; Cornelio Alvarez, TSCRA market inspector; Jesus Barrientes, local ranch hand; and Olvero Almante, a boat captain in the area. In a rescue effort lasting until dark, the team guided four of the cattle and the mare out of the water one by one, leading them two miles through flood waters to high ground. The team experienced heavy currents which caused the boat to sway back and forth between barbed wire fences. At times the barbed wire was caught on the propeller of the boat delaying the rescue for a short amount of time. Garcia said that the toughest part of leading the animals out was the initial half mile of water which reached between two and three feet. Once the animals were in deeper water, they were able to float and the team was able to tie them alongside the boat and lead them to safety. Robert Garcia, a veterinarian with the United States Department of Agriculture (USDA), inspected the cattle and mare that were stranded. Garcia said the Garceno community was waiting at the end of the flooded trail to cheer the team on after every rescue. Additional community volunteers were taught the rescue procedure. The rescue was scheduled to presume Friday morning. "This goes to show that there is no one who cares more about the well-being of livestock than the ranchers who care for these animals everyday. Not only was this a great team effort, but also a great example of animal care," Garcia continued.